Oven roasted sweet potatoes, onions, and chorizo are tossed with pasta for this easy and delicious Sweet Potato and Chorizo Pasta. This Sweet Potato Pasta with Chorizo is based on a recipe from Donna Hay called Oven-Roasted Sweet Potato, Chorizo and Bacon Penne. I changed it up a bit and made a few substitutions. What I love about the recipe though is that it is so easy. You just roast all your veggies and meat in the oven and then toss them with the cooked pasta. You could take that concept in so many ways – changing up the the veggies and the meat. The first change I made was that she called for chorizo and bacon. Now, don’t get me wrong, rarely if ever have I cut bacon from a recipe. However, in this case, I thought the pasta would get plenty of flavor from the chorizo. A change that I didn’t make, but I will from now on, is that she has you roast the sundried tomatoes along with everything else. They got too dried out in my opinion and next time I will just add them at the end with the swiss chard. Which brings me to another substitution, I didn’t have swiss chard, but I did have baby spinach. Last, I didn’t have penne, I had farfalle pasta, one of my favorite pasta shapes! This came together so quick and easy. I love the mix of flavors. The chorizo got wonderfully crispy which paired beautifully with the sweetness of the sweet potatoes. The spinach added a little green to the pasta. I loved the sweet potatoes, but any kind of winter squash would work, also Brussels sprouts would probably be good too!. This Sweet Potato and Chorizo Pasta is an easy almost one dish meal. One pan to roast the veggies and the chorizo and one pan to cook the pasta! Preheat oven to 475. Place the sweet potatoes, chorizo, and garlic on a baking sheet. Top with the reserved oil and salt and pepper. Roast for 15 minutes or until sweet potatoes are tender. Meanwhile, cook the pasta according to directions. Reserve 1/2 cup of the pasta water. Drain and place in a large bowl. Add the spinach, dried tomatoes, and sweet potato mixture and toss to combine. I am currently obsessed with chorizo so I cannot wait to try this recipe! Mmmmm… now I’m ready for lunch! Your Sweet Potato Chorizo Pasta looks awesome, thanks so much for sharing it with us at Full Plate Thursday this week. Hope you are having a great day and we sure look forward to more of your recipes! I love this! So flavourful and easy to prepare! It doesn’t get any better than this! It’s so pretty and looks amazingly delicious! This sounds delicious, Pam! And I love how easy it is. A must-make for sure! 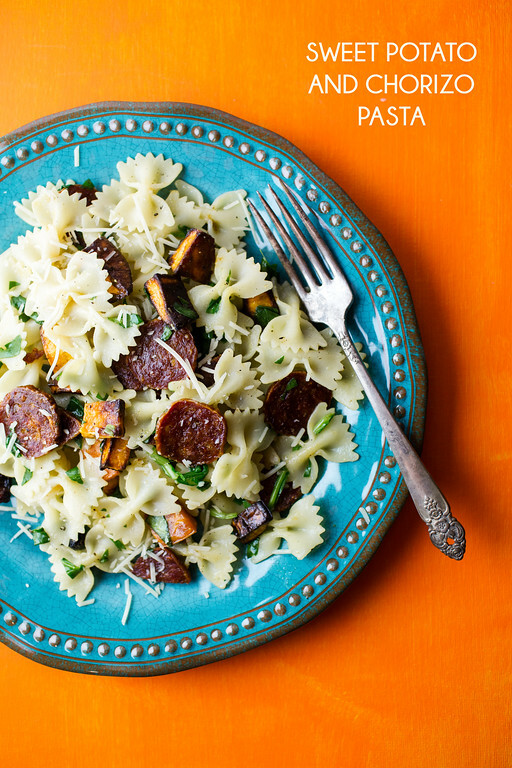 I wish I wasn’t allergic to garlic – I’d love to eat chorizo and this pasta!